Our guide (written by the Institute's Mike Jackson) is now hosted on the Software Carpentry web site so please head over to how to run a workshop (previously called a boot camp). Why has this guide moved? This page used to host our guide on how to run a Software Carpentry boot camp. After a very positive reaction from Greg Wilson, the creator of Software Carpentry, we were asked if we could host our guide on the Software Carpentry web site. In a spirit of sustainability and a desire to contribute to the Software Carpentry community, we agreed and we will continue to develop the guide as part of the Software Carpentry community. Below you can find some quick guidelines and tips for running a workshop. For a paying workshop (either paid for the individual workshop or part of a paid membership), the Institute will provide help with recruiting instructors, lesson planning, managing registration, setting up pre- and post-workshop questionnaires, etc. For a self-organised workshop, the Institute will set up the questionnaires and share the questionnaire results with the host. The Institute does not provide any other support around recruiting instructors, lesson planning, registration, etc. The host is expected to let the Institute know of their plans to run a self-organised workshop in a timely manner. The host is responsible for covering instructor travel and accommodation costs and any facilities management (securing a room, wifi, optionally tea/coffee/food, etc.). Instructors are expected to set up the workshop Web site; the host should share it with the Institute's admin people. The host should make sure that the students fill in Software/Data Carpentry's pre- and post-workshop questionnaires. All questionnaires will be generated for the host by the Software/Data Carpentry or the Institute's admin people. The host should signpost the building so that instructors, helpers and attendees that are not local can easily find the teaching room. The host (or in some cases this falls onto the instructors) should make sure there are sticky notes available in two different colours for the workshop. The host should make sure there is a white board/flip chart with pens available for the workshop. The host should let the students know they should have the necessary software installed before a workshop (having software installed directly on students' laptops is now favoured over running a VM - if you are still using a VM then make sure students have the correct VM hosting software and the workshop VM installed). A tip for the host - having some tea/coffee for the workshop is always welcome (if possible). 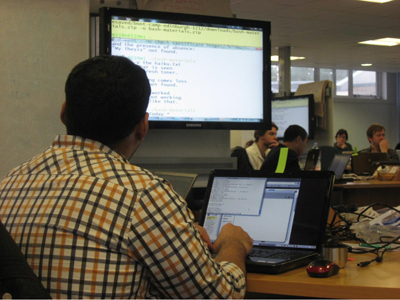 See more on our involvement with Software Carpentry and Data Carpentry.